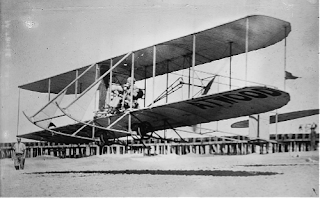 Though the Wright Brothers may have achieved manned flight in 1903, the first decade of aviation in America remained inconsistent and seemingly directionless. Stunt-performing exhibition pilots competed with more serious aviators who sought to perfect the art of flying and push the boundaries of the science in order to demonstrate the capabilities of the airplane. Flights were brief and were limited in distance, and were intended primarily to demonstrate a pilot’s skill or to help perfect the design of a particular plane. Flights were also limited in geographic scope, so consequently, when local residents caught their first glimpse of an airplane in flight in late June, 1911, they were understandably enthralled, with all eyes turned naturally to the sky that morning. In a few weeks, in fact, Atwood became the first pilot to fly over Middleborough and Lakeville when on June 30, 1911, he piloted his plane over the two towns enroute to Fall River and ultimately New London where he proposed viewing the Harvard-Yale crew races. Atwood would later continue from Connecticut to New York City in the process establishing a record for the longest "cross country" flight up to that time. Despite this achievement, it was their first glimpse of an airplane that Middleborough and Lakeville residents found noteworthy. Those who had their eyes to the sky this morning saw aviator Atwood, who went through here at 7:40, headed south. He was reported out of Bridgewater about 7:30, headed for Middleboro. The aeroplane first appeared in the north about 7:35, and it was probably from 600 to 1000 feet in the air. It was making its way, at a good speed, though apparently without effort. The machine passed to the westward of the town, and was observed by many passengers on the trolley cars which arrive here about 8 a. m., as well as by others. It was also seen at the state sanatorium in Lakeville, where it apparently came close to the ground, and then swooped off over Lake Assawampsett and Long pond, apparently headed for New Bedford. 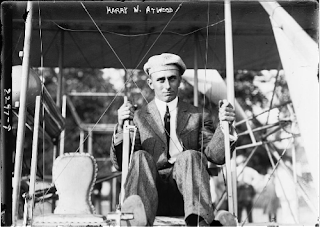 Atwood, that summer, would achieve far wider acclaim by becoming the first pilot to land upon the White House lawn (July 14, 1911) and by piloting a record-breaking flight between St. Louis to New York (August 14-25, 1911). On September 3, Atwood was guest of honor at a reception at the King Philip Tavern at Lakeville and he was still at the height of his fame nationally when he appeared on Friday, October 18, 1911, at an air meet in Middleborough. For some time, Atwood had been looking for a suitable opportunity to display his aviation skills to his relatives, including his grandfather. In October, 1911, Atwood was engaged for a performance at the Brockton Fair, and he believed that timing would be ideal for a demonstration for his family. Two stories survive giving differing views on how Atwood settled upon Middleborough as the locale for his exploit. One relates that Atwood’s manager, Thomas McLaughlin, “a Boston newspaper man”, contacted James H. Creedon of Middleborough who also worked as a journalist and may have been known to McLaughlin. A different tale relates that Atwood, his performance at Brockton having been cancelled on October 5, traveled to Middleborough to visit with his cousin, pharmacist Kenneth L. Childs who proposed the meet. Regardless of which version is correct, Creedon, Childs and Harlas Cushman of Miller Street worked to promote a meet at Middleborough. In order to prepare for the meet, Atwood toured the countryside about Middleborough, in search of a suitable makeshift landing field. Ultimately, he settled upon Fall Brook Farm, located at the intersection of Wareham and Grove Streets which featured a large, level, cleared field stretching between Wareham and Tispaquin Streets. At the time, the farm was operated as an automobile inn and the proprietor no doubt saw the meet as a means of attracting business. Besides visiting relatives, Atwood spent time preparing his biplane, a Burgess-Wright model, for the meet. Some days before the meet, “a back-firing of the engine broke both propellers and this damage had to be remedied here.” On Sunday, October 13, Atwood gave a few short exhibition flights, and on either the 13th or 14th he took a longer flight to New Bedford accompanied by Edwin C. Cotton. Although the New York Times reported on October 16 that Atwood's flight from New Bedford to Middleborough took only twenty minutes, other sources reported that on the return flight, Atwood had broken the flight, landing in a large field in the vicinity of one of the Quitticas ponds in Lakeville in order to make adjustments. The advent of the temporarily grounded plane was a novelty and not surprisingly created a stir. The place where he had landed the machine was two miles from the Middleboro-New Bedford trolley line, but that did not faze some 2000 persons who flocked to the field to get a look at it. They had to walk in some distance from the highway to get their look during the day it was there. Later, Atwood “took to the air and an old time account relates he made a perfect flight and remained in the air about 12 minutes.” Three days later, on the 16th, Atwood was in New York securing “a new motor and propellers … should their use be necessary.” And while early reports of the meet indicated that Atwood would “instruct a few pupils here in the days before and after the meeting,” it’s not clear whether he did so. One eager would-be aviator, however, C. E. Jenney of Indianapolis who was summering nearby approached Atwood at his Middleborough hotel and requested to be taken on as a student. he ran into a heavy rain shower, which continued several minutes. He said when he alighted that the rain drops struck his face like bullets. He did some skillful work in fancy flying which thrilled the crowd. He found the air dangerous, however, and somewhat squally. For the subsequent two flights, Atwood invited a passenger along on each. 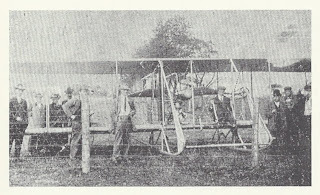 Mrs. Edwin C. Cotton accompanied Atwood on his second flight of five minutes for what was her first time in the air. Completely exhilarated by the experience, she informed reporters that “it was perfectly delightful, and I don’t ever remember of enjoying anything so much.” Atwood’s second passenger that afternoon was his chauffeur, Leo Malanson. Following Atwood’s performance, his plane was left behind at Fall Brook Farm where it was “drawn up behind a barn and lashed to the ground,” likely attracting the curious. Later, “a representative of the factory” arrived in town to disassemble the plane which finally, on November 4, was shipped from Middleborough. While Atwood never again flew at Middleborough, he did continue to visit the area at least. In November, 1911, he is recorded as having visited friends in town in company with Edwin C. Cotton. Harry N. Atwood at the controls of his Burgess-Wright model plane, Bain News Service, publisher, photograph, between 1910-15 (Library of Congress). Designed by Marblehead, Massachusetts, yacht builder W. Starling Burgess and manufactured by the Wright Company, the Burgess-Wright plane featured a 35 h. p. engine and was capable of flying up to 40 m. p. h.
New York American, "Atwood Flies to New York from Boston", July 2, 1911 (Library of Congress). The New York newspaper trumpeted Atwood's achievement in flying from Boston to New York, the longest "cross country" flight to date. The flight was also marked the first appearance of an airplane over either Middleborough or Lakeville. Romaine erroneously gives the date of the flight over Middleborough as June 28. Harry N. Atwood, Grant Park, Chicago, photograph, August, 1911 (Library of Congress). Atwood is seen during a stopover in Chicago on his record-breaking flight between St. Louis and New York. The flurry of activity surrounding the plane is indicative of the excitement created wherever Atwood appeared with his plane. 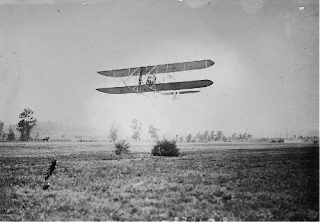 Harry N. Atwood in Flight, Bain News Service, publisher, photograph, between 1910-15 (Library of Congress). 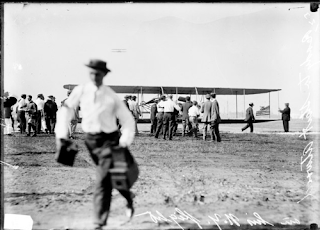 Harry N. Atwood in Flight, Bain News Service, publisher, photograph, 1910-15 (Library of Congress). Atwood posed for this commemorative photograph along with the promoters of the 1911 Middleborough air meet. Brockton Daily Enterprise, "Seen in Middleboro", June 30, 1911; "Middleboro", October 7, 1911; "Atwood Day Aviation Meet", October 11, 1911; "Middleboro", October 14, 1911, and October 17, 1911; "Flies His Kinfolk", October 19, 1911; "Carried Passengers", October 20, 1911; "Middleboro", October 21, 1911, and October 29, 1911; "Shipped to Atwood", November 5, 1911; September, 1952. Mansfield, Howard. Skylark: The Life, Lies, and Inventions of Harry Atwood. Hanover, NH: University Press of New England, 1999. New York Times, "Flies 135 Miles with a Passenger", July 1, 1911, and "Fast Flight by Atwood", October 16, 1911. Harry's my wifes great grandfather. Great Post! Is this information available in either of those books? Very impressive and enjoyable read!